FreeTrack Forum - FIXED! Access violation error in v2.2! FreeTrack Forum > FreeTrack : English Forum > Support : FreeTrack Software > FIXED! Access violation error in v2.2! I understand it's never popular on any forum to make ones first post anything other then a glowing affirmation of how everything is great. I'm not quite sure I understand this real clearly, and I sincerely hope I am misunderstanding. As I understand this, if one gets this specific error, then one MUST change their DPI for their entire operating system to the default DPI when ever one would like to run FreeTrack? Please tell me I'm mistaken. The reason I'm amazed is two fold. The first is that folks consider this a "solution" as the title of this thread indicates. I would consider this a "work around" in the most complimentary way of putting it. It requires that everyone with a non standard desktop DPI setting Reboot their machine every time before using FreeTrack and once again rebooting the machine when done using FreeTrack, along with having to go into display settings every time, to reset the DPI for every day use. This has worked 100% of the time, to allow any applications and games/Sims to run properly. Now along comes something that doesn't work this way. For those of us who have a very hard time with reading "small" text, the only way a computer can be somewhat useful to us, is to be able to increase the DPI so we can access the web and read PDF's etc.. Many years ago I was into programming, but have been out of the loop so long I'm afraid that Trying to tackle the code changes to allow FreeTrack to take advantage of that 'switch' in the compatibility tab, is beyond the time I can devote, with little great grand kids running around and such. I do hope for the sake of us folks who have problems with text, but not in game/sim graphics, some kind soul will come along and insert a code change and not consider this a "solved" issue but a "work around" until/if such time that happens. Edited by aairon on 17/08/2010 at 20h29. It's great that you have identified the problem, but it is by no means fixed or solved. Fixed or solved would mean that I could use the program without having to change my DPI settings all the time. In the past it wasn't a big problem because you could set the resolution low enough so that you didnt have to mess with the DPI. But with modern large LCD monitors, lowering the resolution from the natural LCD screen resolution makes everything fuzzy. I do hope someone will look into it because it is approaching a year and no solution to this problem has been found. This is the first program I have ever encountered that requires you to lower the DPI to default to make it work. FreeTrack works if you don't use XP style scaling. Since FreeTrack is not DPI aware Windows will use virtualization to enlarge the window so that it will work properly. Go to 'Set custom text size (DPI)' in Windows and uncheck 'Use Windows XP style DPI scaling'. If you want a program that is not DPI aware to use XP style scaling you can specify it by right clicking on the executable then going to properties, compatibility then 'Disable display scaling on high DPI settings'. When Windows is using XP style scaling you can't enable virtualization for a specific program. I get this error once in a while, the only way I know to solve it is to uninstall/reinstall FreeTrack. It happens when I select a profile I made myself and then it keeps making error windows until windows itself forces FreeTrack to shut down. I think I know why I get this error. I think it's because I configured the profile to use a button on a device (joystick/steering wheel) that is not plugged in at that moment, but I'm not sure yet. Yes, that was definately it. If you get this error it's because FreeTrack is looking for a device which you programmed a profile with which is not plugged in (recenterbutton on a joystick or steering wheel for example). Edited by Blindasabat on 25/10/2011 at 23h53. Access violation at address 00401CB6 in module 'FreeTrack.exe'. Write of adress 4029B30D. Exception EAccessViolation in module FreeTrack.exe at 00019779. Any ideas, why it does this? I had an access violation error with freetrack too. 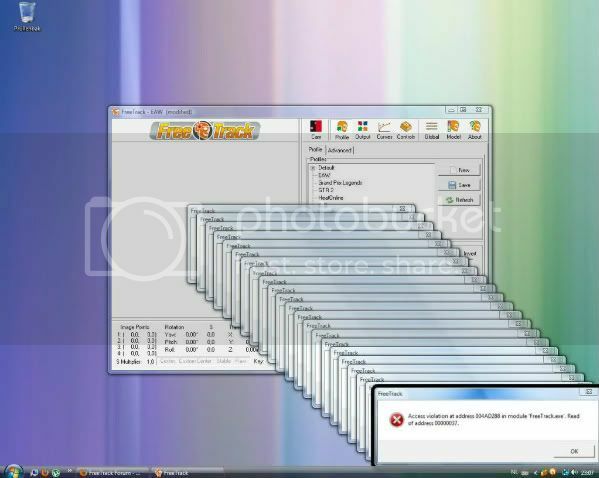 I found an alternative exe file somewhere on these forums called Freetrack640x480.exe. copying this into the freetrack install directory and running from there works for me. it's not perfect, there're a few things that don't work for me. I have to set the camera settings each time, for example, other than that it seems to work great. Was quite a while ago I found that exe so don't have a link now. I'm getting EAccessViolation in module Freetrack.exe at 0001A259. Access violation at address 0041A259 in module "Freetrack.exe" Read of address 40239CA6. I'll try changing the DPi to see if it fixes it but if that's the only workaround my Dad won't be able to use Freetrack on his PC as he needs the larger DPI to use his PC. EDIT: Also, after getting this error Freetrack's window doesn't appear but it's left running using 33% of the CPU. On a couple of occassion before I realised this, I tried running it a couple of times more, resulting in three instances all using 33% and grinding the PC to a halt and I had to press Ctrl-Alt-Del twice, wait for ages and eventually I was able to get to the Task Manager and kill them. Edited by doveman on 31/08/2012 at 19h04. The "XP style DPI scaling" option is greyed out for me. It unticks itself at 150% or 200% but is ticked at 100% and 125% and there's no way for me to change it. Maybe because I have DWM/Aero disabled. EDIT: Yeah it was because I had dwm.exe disabled. With that enabled I can untick "XP style DPI scaling" at 125% but Freetrack still gives the same error. I don't use Aero as such, just Windows 7 Basic Color and I need Aero/DWM disabled normally anyway. With it set to 100%, Freetrack does work fine. Edited by doveman on 31/08/2012 at 19h32. I came up with a usable workaround, which is to set my Dad up with a separate gaming account on Windows 7, so when he wants to fly X-Plane and use Freetrack, he just logs out of his normal account, which is set to 125% DPI and into his Gaming account, which is set to 100% DPI. As he'll only be using that account for gaming, it doesn't matter that text and icons are a bit too small for him. It also has the advantage that it closes all his running programs and I can make sure only the bare minimum loads when he logs into his Gaming account, reducing the chances of some program causing problems whilst he's flying. Exception EAccessViolation in module FreeTrack.exe at 00019779. Access violation at address 00419779 in module FreeTrack.exe. Read of address 40293CA6. Is this problem present in the previous version. The fact that I have to keep my DPI at 100% causes major problems for my work flow. Are there any plans to fix this issue?